As a certified Handwriting Expert, I can tell a lot about you by how you write. behavioral patterns, motivations, personality and more. Want to know what yours says about you? Looking for Career Advice? A Presentation for your group? I can help you with that! Check out my interview with Stacy Raske Martin on Facebook! Do you currently teach school? We need to hear from you! ​Will you take a moment to complete a research survey on what is actually being taught in regards to handwriting/printing in our schools today? ​It will only take a moment of your time! As the Education Chair for the American Handwriting Analysis Foundation, I welcome anyone interested in graphology to join our online Study and Sample Discussion Group online. If you want to submit a sample for discussion and come as a guest, simply email me to let me know! I'll put you on the free "Guest List" and you can join us online! No string attached. Come, learn more about handwriting, human behavior and personality with us! I am available for human resourcing development seminars, community events, career fairs, genealogical meetings, family reunions, and more! Email a handwriting sample as a PDF attachment for analysis, or have me come to you. Details for samples and for analysis can be found here. If you are looking for a dynamic, interactive and entertaining presenter for your next function, I will be happy to customize an event to meet your needs. 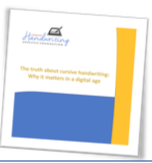 "The Truth About Handwriting: Why it Matters in the Digital Age." Handwriting does have a superior influence on the way we learn, develop memory and fine motor skills, and so much more! This paper has been presented in 11 countries, in 5 different languages. It has been referenced to by schools, senators, legislators, PTA groups, home school networks, and more! In recent weeks, 15 states have passed legislation to bring cursive education back into the classrooms. Read the White Paper to see why, and then tell your legislator about it! Share it with your school's PTA and ask them to bring back practice in the homework assignments. Share this free publication with teachers, parents, psychologists, social workers, neurological and occupational therapists...and everyone you know! Download this free "White Paper" here!